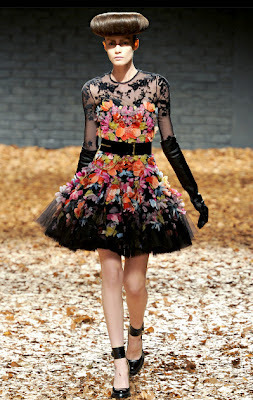 Taking cues from the photo, I focused on the black belt, the black lace-against-skin, and the flower colors. How 'bout that crazy hair-do on the model?? I used a new stamp set, bought while out with my mom this week. It's Recollections brand from Michael's, half price, with no name. 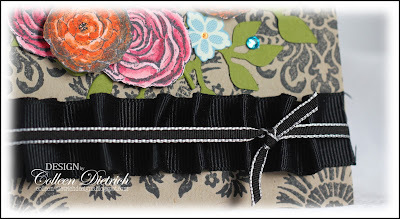 Each damask flourish you see was individually stamped, using a Stampamajig placement tool. The pink and orange flowers are Anna Griffin, stamped/colored/and trimmed. 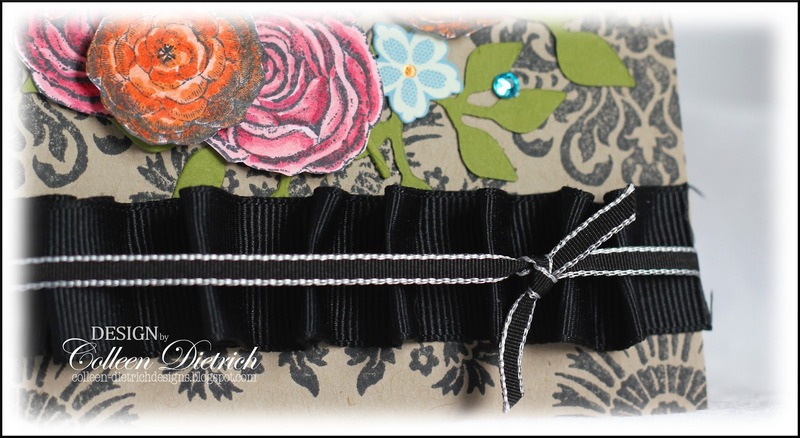 I backed the wider, grosgrain ribbon with double-sided tape, then pleated as I laid the ribbon onto the card. My new camera and I have not seen eye-to-eye yet on the macro detail shots. I am hoping to get much closer, and did buy a new 50 mm macro lens for it, but still I'm not there. Anyone have any tips? Well done, Colleen! This one scared me and I didn't even try, but I love what you came up with!! What a photo! Great job with that inspiration! Such a pretty card Colleen! I love how you interpreted the inspiration photo! It's not an easy one. BTW, all 7 rejected from PC, but I submitted one to Card Maker and they accepted it today for a SIP that will be published in Sept!! Wow, you hit that one on the money! Fantastic job with this! Beautiful beautiful details! Your card has just the right mix of everything!!! Wonderful take on the insp. piece! Love the pops of colour! Great card. Oh my how PRETTY Colleen! Love the vibrant pops of color against the kraft and black. Great take on the inspiration photo!! I just love your interpretation of the inspiration photo.. Such a pretty card..
Love the blue gems dancing around! Such an elegant interpretation of the inspiration photo! Really beautiful! What a fun card, Colleen, love the stamped background! Thanks for joining us for the Papercraft Star spring challenge. Haha... how funny... I hadn't noticed the hairdo until I read your comment about it... I thought it was a hat at first glance. LOVE your card, though... fantastic!!! Just perfect, Colleen! Great interpretation of the goofy model! I thought it was a hat too! Love the black on kraft which sounds better than black on skin. Fun pops of color. I still don't see how you come with these time after time! 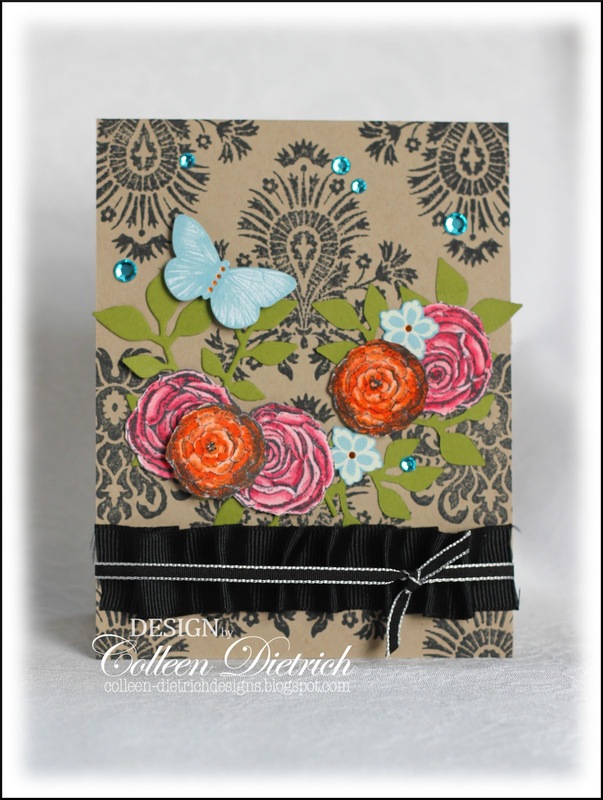 What a pretty butterfly, flowers and gathered ribbon! You used this photo inspiration so beautifully! Perfect interpretation! Lobe the flower, butterfly and the ribbon too! 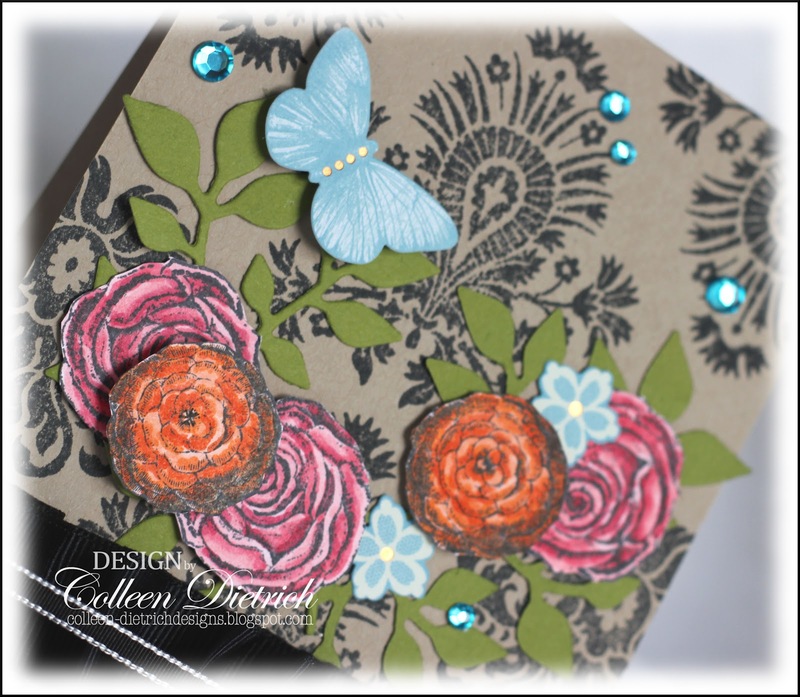 what a fabulous card for the inspiration pic, colleen! Oooo! This is beautiful, girl! LOVE that pleated, black ribbon and all those bright, happy colors on your neutral base! Thanks so much for playing along with us this week at Papercraft Star! Yep I can see your inspiration! I too love things by Anna Griffin. I'm so happy you shared your creation with us this week at Papercraft Star! Oh, very cool take on that high-fashion photo, Col! I can see exactly where each element came from :). And aren't those colors so pretty? Sounds like you found some bargains out with your mom. Those new damask-y flourishes are very cool. Love the damask and the pretty Anna Griffin flowers. Beautiful card!! WOW!! This is beautiful! Love the colors and elements! Your design/color choices are so dramatic...catches your eye immediately! Love the color combination and all those beautiful flowers! I love the pairing of black, kraft, and those bright colors! Thanks for playing along with the Runway Inspired Challenge! This is really lovely, Colleen! I love the damask black on kraft, and those flowers and butterfly are so pretty! love that pretty ribbon treatment! Holy cow! You stamped all of that in the background? It looks amazing! Thanks for playing with us at Runway!